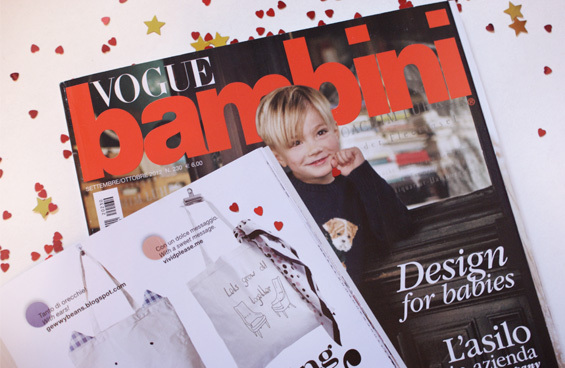 Featured In Vogue Bambini Magazine!! 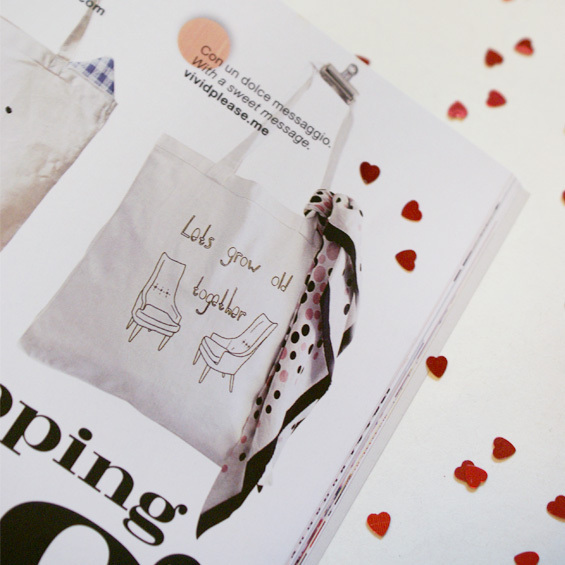 Our Lets Grow Old Together bag is officially a superstar! 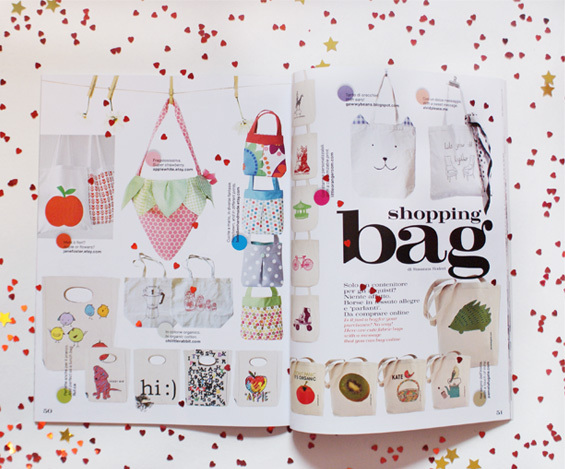 Incase you didn’t see it, we’re delighted to finally be able to show off our massive achievement of getting our amazing tote bag grace into the pages of Fashion Worlds most important magazine. And we’re jumping for joy!! Vogue Bambini is from Italy’s collection of the Vogue publications, though they are available throughout most of Europe – we even saw some copies of the previous issue whilst we were in Paris 🙂 They come out quarterly, so we know that our issue will be on the shelves all over for a few months! How amazing is that?! We hope you’re as delighted as we are! To celebrate our feature, we’ve got a limited few available with a big discount 😀 Better get in there quickly! That’s absolutely amazing! Congratulations on the HUGE achievement–especially just in time for the holidays! Just wonderful, how on earth do you manage it?! It’s seriously a dream of mine – a small one, but a dream nonetheless – to make it into a magazine like this but I have no idea how to go about doing it. Congratulations on yet another publication. We really can’t believe it ourselves, it’s just crazy! Being in such an amazing magazine is just such an honour as we’re only a wee (and still really new!) start up — and to think it’s my freaking illustration they were wanting to include blew my mind!! What happened was they found us through Etsy and contacted us directly, then asked us to supply a couple of images. We then had a painfully long wait to find out if we had made the cut. When we got sent a pdf of the article I just about wet myself! haha 😀 Then it took about a MONTH to get a copy of it over from Italy as their postal service is shocking. 2 got lost en route and are yet to be seen! We didn’t want to say anything till it was physically in our hands as we’re just totally mind blown by it! Fingers crossed incredible opportunities like these keep coming in; it’s a fickle industry and really unpredictable! Thanks for your amazing support, we couldn’t do it without good friends to keep us sane! Oh my gosh!!!! Vogue! That is too awesome, congrats! That is so amazing well done!